I will post about Boston and the fun stuff I did there later — when / if I finally get organized. 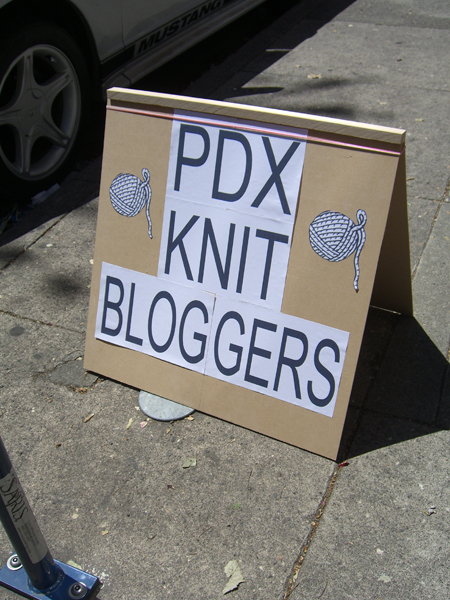 But first I want to tell you about the wonderful time I had yesterday at the first PDX Knit Bloggers meet-up. The PDX Knit Bloggers group was born when several of us were blown away by the number of people who had their hand raised when The Yarn Harlot asked how many people in the Portland area blogged. There’s a bunch of us. So of course, being both bloggers and knitters, a little gathering was necessary! The official sign was provided by Bobbie’s husband Tool Man. I love it! Be sure to click on this picture to see the biggy-size version. I stitched it together from several pictures, so some of the angles of tables and such might look a little wonky. But it gives you an idea of how many people where there. This represents about 1/2 of the bloggers that have joined the PDX Knit Bloggers list. Knit Purl provided us with a space, iced tea, ice water, and door prizes. And… well… cookies and brownies where there also and I did try a couple. 😆 It was sooooo cool to see everyone and the lovely projects they are working on. I laughed and laughed and chatted and commiserated and celebrated and had a wonderful time. Did I mention there were door prizes? People with stickers under their chairs were treated to a little surprise. Mine was the Shibui Merino Alpaca in Bark that you see in the upper right of this picture. In the upper left of the picture is hand-dyed superwash sock yarn from Fearless Fiber’s Etsy shop in colorway Marrakesh. This is wonderful, sprongy, 100% merino yarn that has been rainbow-dyed in a gorgeous and subtle combination of different greens with touches of mustard and bronze. The picture doesn’t begin to show how lovely this yarn is in person. Go, now, over to Fearless Fibers and check out Deb’s lovely yarns and patterns. Yum! In the bottom row… Well, Knit Purl is a yarn shop. 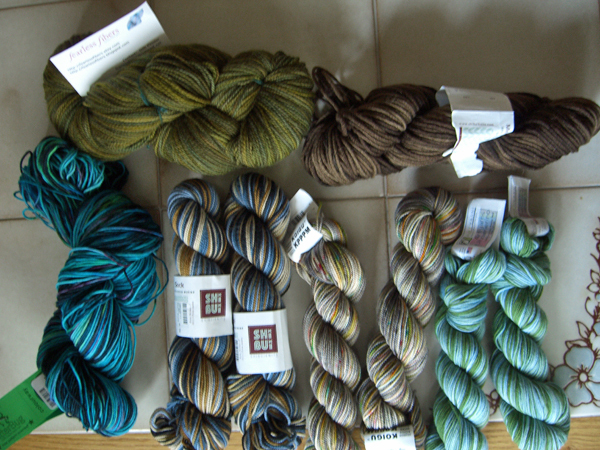 L-R: Colinette Jitterbug in Jay, Shibui Sock in Stone, Koigu KPPPM in P342 – a mostly gray/brown with flecks and short runs of bright orange/green/yellow/red/blue, and finally Artyarns Ultramarino in 139 (don’t you love colorways named with numbers?) – I had to have this because the colors are exactly the PI blog blues and greens, and how perfect is that?